Photo editing is one of the most interesting tasks to do. The latest software tools assist us better with lots of creative features that can make editing task much easier. Users can remove the certain object from an image or can clone one portion to other as per need without destroying the natural look. Some of the most popular editing tools that are often used by professionals are color adjust, rotate, crop and clone stamp. If you are searching for a software tool that can help you to remove unwanted objects from images, prefer to go through the article below. Here we have reviewed top 5 applications for Android users that be used to remove objects from images. If you are using an iPhone, you can check the Best 5 Photo Apps to Remove Unwanted Objects on Your iPhone . 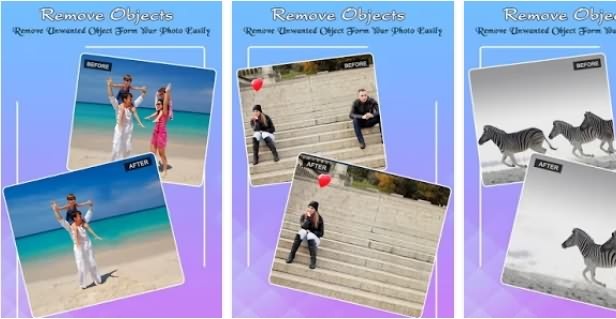 This app is widely used by Android users to remove unwanted objects from images. It is designed with an intuitive and user-friendly interface that can be accessed by beginners as well. 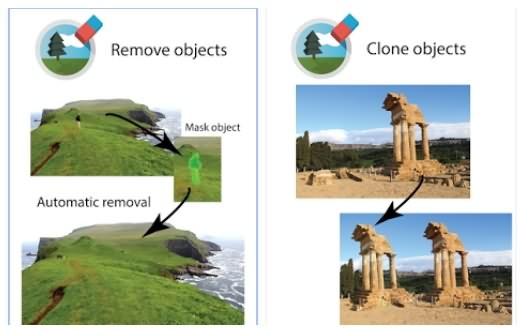 In order to remove objects from an image, users simply need to choose healing option from the bottom portion of the screen and then choose Spot Heal option. Adjust the hardness and size of the brush and then manually highlight the object to be removed. Soon, the object will disappear and the area will be covered by surrounding details of the image. Face aware liquefy image will help you to make creative changes to the facial features. You can fix all the imperfections using heal and patch tool. This app allows users to adjust light intensity in the specific parts of images. Use defocus option to blur certain part of the image to make it more useful. 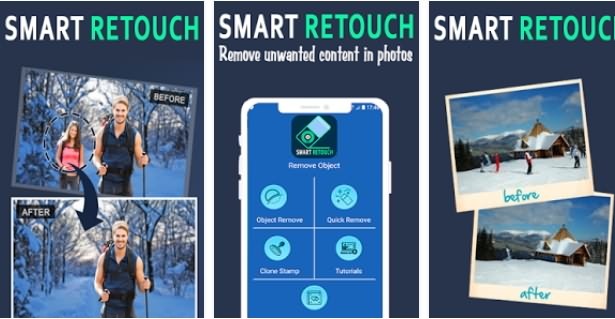 This dedicated object remover tool helps to erase certain specific part of captured photos and give them a DSLR like an appearance. It allows users to access selection and clone tool to make desired changes to the image. With the selection tool, you can select and remove a certain desired portion of the image whereas the clone tool allows users to copy one portion of the image and fix it at some other part as per need. With the help of advanced brush tool, you can simply draw over the unwanted objects and hit the start button to remove the highlighted part instantly. Easily adjust opacity, hardness, and size of the eraser and stamp tools. Use Lasso or Brush tool to remove a certain unwanted portion of the image. Access clone stamp tool to remove defects from the image. The blemish tool will help you to remove blemishes with ease. PixelRetouch can help you to get rid of all the unwanted scenes from pictures. All that you need to do is simply open the app and then select your image to be edited by hitting Albums option on the screen. Once your image opens, you can choose the Object Removal tool from the bottom of the screen and start drawing over unwanted element. The lasso tool and brush tool can help you better to use custom size for object selection. Once your selection task is over, hit Go button and that selection portion will instantly disappear. Remove power lines, posts and telephone wires from images. Capable enough to remove curved and straight scratches from images. 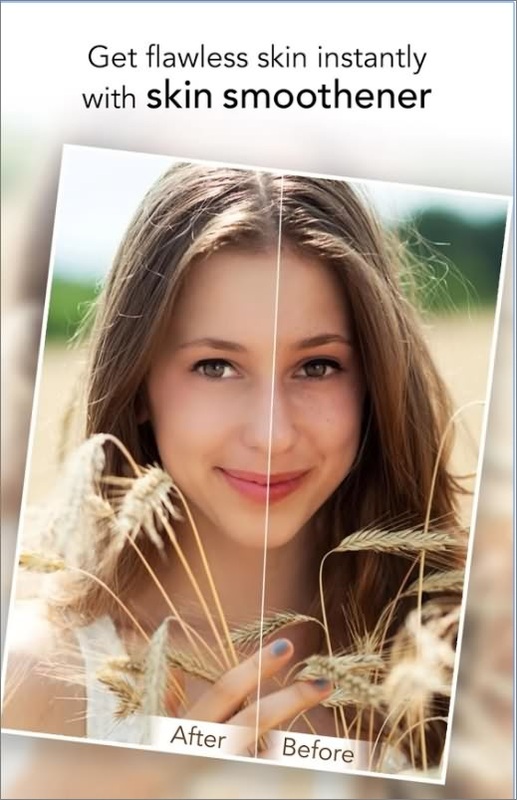 Instantly make your photos beautiful my removing skin blemishes and pimples. This easy to use tool is available for free. This app is available for free to all Android users and it can help in fast object removal with its simplistic design. It allows users to remove shadows, people and other unwanted objects from images. Anyone can start working on this app with ease and if you find some difficulty you can access it’s easy to understand tutorials online. There are lots of creative editing tools including rotate, crop, one-touch filters, blur the background. Once your edited image is ready, you can share it directly on social media platforms such as Instagram and Facebook etc. How to remove objects with YouCam Perfect? Step 1: First of all, you need to download this app on your android device from Google PlayStore. Step 2: Once you have installed your app, open it and move to an image file. Choose your desired editable image and import it into the app platform. Now hit the edit button and next select Removable Tool. Step 3: It is time to highlight the undesired area and finally hit Apply button from the bottom of the screen. The undesired portion of the image will soon get disappeared. This application allows users to choose any photo from gallery and remove undesired elements from it instantly. All that you have to do is download this app on your device and import your desired image to the app platform. Then go to the Remove option and choose Pen under this category. Now, you have to draw over the unwanted object and once you are done with your selection, simply hit the Tick button. It will instantly remove the object from the image. Note that background of the removed portion will be automatically filled with content available at its surrounding area. Get rid of pimples and blemishes from your selfies. Remove all scratches and stains instantly from images. Zoom feature added for precise selections. Lasso tool assists in quick masking. To be honest, if you need to edit and perfect your image further, it would be better to do it on the computer. And if you are looking for a photo editing software which is easy to use and also provides plentiful features, we recommend you to try Wondershare Fotophire. With Fotophire, you can erase the unwanted people or things from your image , split the background and foreground and change the image background easily, and perfect your photos with more than 200 photo effects.